We transport products to and from Italy, France, Spain, Germany, Netherlands, Belgium and elsewhere. 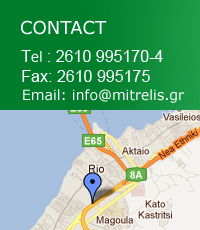 We also undertake the temporary storage and distribution of merchandise for the region of Patras. The company-owned fleet consists of state-of-the-art vehicles and is impeccably maintained. All of our vehicles are equipped with anti-theft and GPS systems. This allows us to determine the best possible route and control the operation of our vehicles. Thus, we offer immediate information to our customers about the progress and route that they loads follow. Our premises, both indoor storage areas and outdoor space, are supervised by CCTV and there is also round the clock security service.